EAGAN, MN – The Dakota County Regional Chamber of Commerce had its annual Business Excellence Awards Friday, November 9th, 2018. The annual event is an important opportunity to recognize local businesses, non-profit organizations, and individuals for their outstanding work and impact they have on the community. 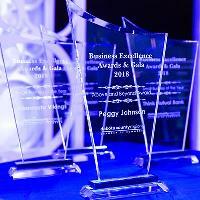 The Business Excellence Awards recognize the dedicated individuals who are making a positive difference in their community every day. It is rare that these individuals, companies, and organizations get the recognition that they truly deserve. The celebration is a way to raise awareness of these accomplishments, help the community learn more about the impact individuals are having, and celebrate the success of key local for-profit and non-profits. Two of the five categories recognize an individual who has continuously made an impact on their community over the years. This year, those individuals are Peggy Johnson, who was recognized for her exemplary service in the community with the Above and Beyond Award, and Scott Swenson who was recognized for his leadership, mentorship, and business acumen with the Legacy award. Dakota County Regional Chamber of Commerce is committed to building a stronger regional business community. We steadfastly serve the cities of Eagan, Farmington, Lilydale, Mendota, Mendota Heights, Rosemount, Sunfish Lake, and West St. Paul, along with Castle Rock, Empire Eureka, and Hampton Townships. Explore the many ways we’re leading the way to make the Dakota County area the best possible place to live work and grow business at dcrchamber.com.